We’re talking four ingredients and a few quick tricks to take you from packaged puff pastry to a tempting treat worthy of a spot on your local bakery’s dessert display. 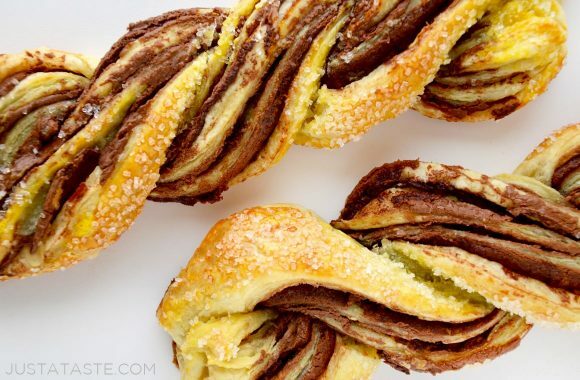 Simply unfold the puff pastry and slather it generously with your chocolate hazelnut spread of choice. 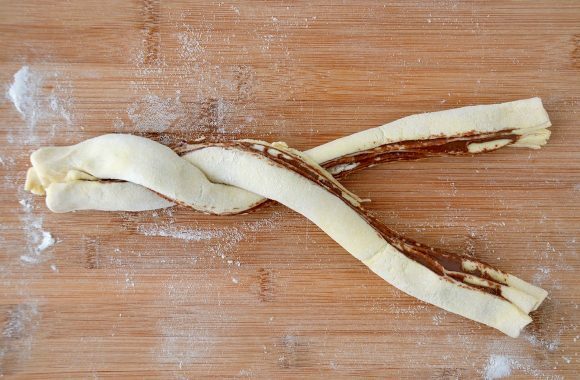 Then roll it up tightly into a log and slice it lengthwise to expose layer after layer of chocolate-covered dough. Transfer your twists onto a baking sheet lined with parchment paper or a Silpat, which is my go-to when it comes to baking. Silpats offer all of the nonstick powers of parchment paper but can be reused time and time again. Finish off your creation with a quick egg wash to ensure golden brown edges all around and then let it rain with a shower of sanding sugar for added pizzaz and crunch. 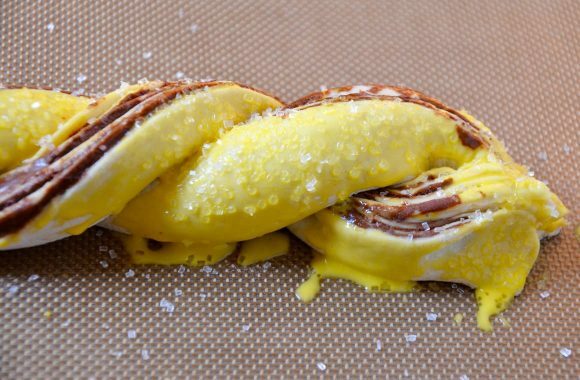 The result is two extra-large puff pastry twists loaded with chocolate and ready for slicing and serving with a cold glass of milk. Looking for more creative recipes starring puff pastry? Don’t miss our top-rated recipes for Cheesy Puff Pastry Baked Eggs, Raspberry Cream Cheese Pinwheel Pastries, Easy Sticky Buns and more buttery favorites. Preheat the oven to 350°F and line a baking sheet with parchment paper or a Silpat. Unfold one sheet of the puff pastry onto a lightly floured work surface. 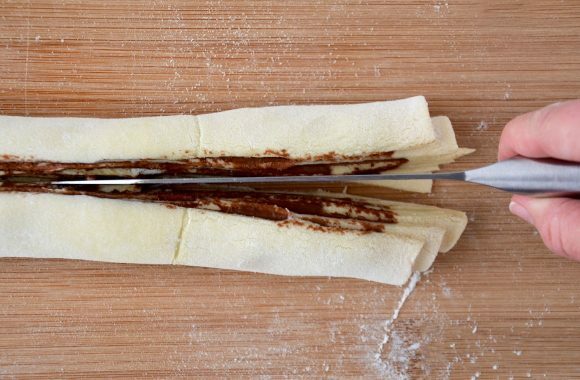 Using a rolling pin, lightly roll the pastry to seal together any folds. 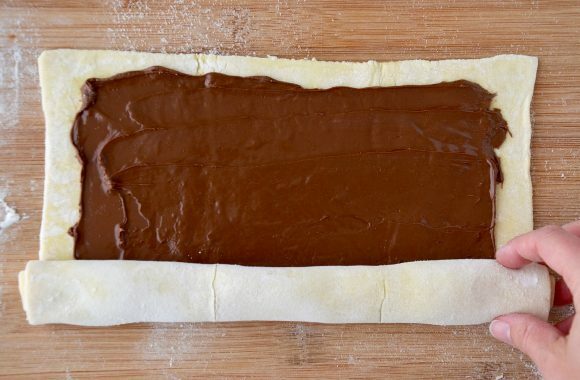 Spread 1/2 cup chocolate hazelnut spread on the pastry, leaving a 1 inch border around all of the edges. Beginning on the longest end, tightly roll up the pastry into a log. Cut the log in half lengthwise then carefully twist together the two pieces to form a braid, pinching the ends together to hold the braid in place. 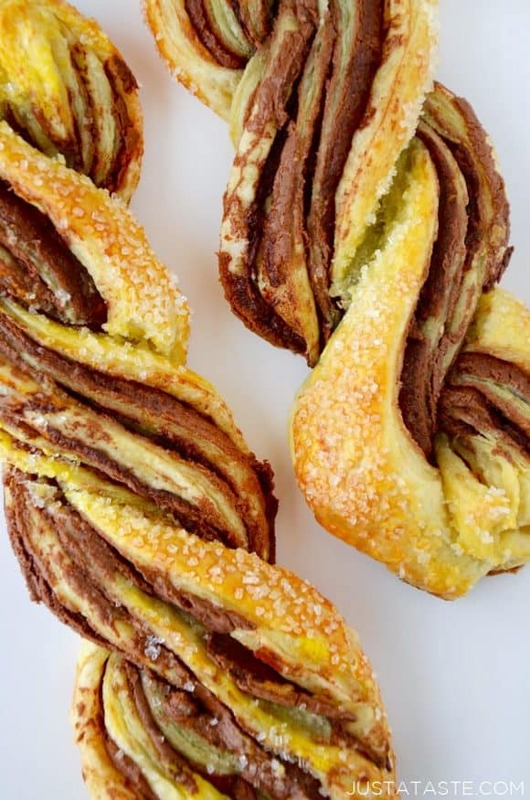 Repeat the filling, rolling and braiding process with the second sheet of puff pastry and the remaining chocolate hazelnut spread then arrange the twists on the baking sheet. In a small bowl, whisk the egg then brush it atop the twists. Sprinkle the twists with the crystal sanding sugar (optional) and bake them for 20 to 25 minutes or until they're golden brown and cooked through. 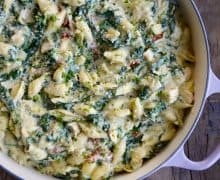 Remove the twists from the oven and allow them to cool for at least 10 minutes on the baking sheet before slicing and serving.